This pastel princess is made in the USA and sports a 150cc silver engine, metal flake seat with accent piping & wide whitewall tyres. 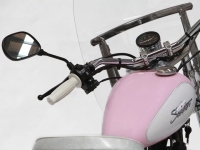 But don't be fooled into thinking it's just a softie, it also comes with: solid steel wheels, steel petrol tank, front and rear fenders, billet aluminium front triple tree & has a durable powder coated frame. 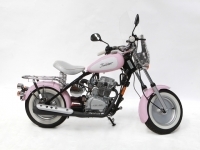 With both electric & kick start & astounding fuel economy, this baby is fantastic for all women riders!